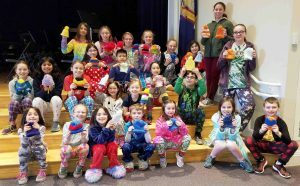 Dubbing themselves the “Setauket SACC Super Stitchers,” 24 students who attend Setauket Elementary School’s SACC program worked from mid-January to mid-March to learn to loom knit hats in baby and toddler sizes. As part of a different community service project each year, the program either makes or collects items that are distributed to worthy causes. This year’s hats project is being donated to the Child Life Services program at Stony Brook University Hospital. The students’ hard work and dedication resulted in 30 completed hats. Photo caption: Setauket Elementary School students in the building’s SACC program created 30 hats for the Child Life Services program at Stony Brook University.